One of THE main attractions of my entire trip through Africa was the opportunity to visit the infamous Mountain Gorillas in the Virunga Mountains of Rwanda. A once-in-a-lifetime chance to come face to face with King of the Apes? Yes, please! We had to register with the Rwandese government months in advance in order to get special permits issued prior to our arrival in Rwanda, as they are extremely limited- and thus in very high demand. The government controls the number of these permits in order to reduce the amount of people visiting the gorillas in an effort to preserve their habitat. Thus, the permits don’t come cheap- $500 US when I was in Africa, with rumors of the price hiking to $1000US. The money raised through the sales of the permits goes towards the protection and preservation of the mountain gorillas and their habitat- a worthwhile cause- and, again, since it was a once-in-a-lifetime chance, I couldn’t pass it up. We completed the paperwork months in advance, our permits were issued, and rain or shine, we were going to visit a family of mountain gorillas when we got to Rwanda. We arrived in Musanze- the launching point for our trek- late in the afternoon, and got straight to the business of collecting our permits and getting all of our camera batteries charged for the following day. We were told that the weather in the mountains could change in minutes, and had to pack for every possibility- rain or shine, hot or cold- chances were we would see it all during our trek into the mountains. All preparations completed, we set our alarms for EARLY the next morning (4am), and hit the hay with visions of King Kong dancing in out heads. We knew that EVERYTHING about the trek was based on the gorillas’ daily schedule- they feed at certain times, they play at certain times, they rest at certain times- and this routine was used to determine the best time for people to visit the gorilla families. The difficult part was that the gorillas typically move overnight, making it necessary for spotters to locate them in the dense forest and radio their position down to guides at the park office prior to the groups setting out. As a result, the hike up the mountain to reach the gorillas could range anywhere from 30 minutes to 3-4 hours, depending on where the gorillas had settled for the day. Because of this, we had to be at the park office early enough to ensure that we would be able to reach our designated families at the appropriate time of day. It was still dark out when we were picked up from our hotel, and we couldn’t see the town and surrounding countryside we were driving through. Most dozed off, heads rolling an bobbing along with the bounce of the truck as it rumbled down the pot-holed roads towards the park. Eventually, we pulled off the bumpy road and into the parking lot, greeted by a welcome sign flanked by a huge gorilla statue. We climbed out of the truck and stretched in the gravely parking lot, and it was then that we caught our first glimpse of the Virunga Mountains- the home of the mountain gorillas. Awesome, startling, rugged, lush, vibrant- all words to describe those incredible volcanoes on first impression. The sun had finally risen, and they were bathed in a yellow light that seemed to amplify the deep green forests that blanketed them. They were so unique- unlike any mountains I had ever seen before- organic in some way. How they rose out of the surrounding hills, soaring above the fields and forests, their almost pulsing green contrasted against the bright blue sky- it was surreal. After grabbing a cup of tea, we were split up into smaller groups and assigned to a gorilla family. Each group numbered about 8 people, and there were probably 6-8 groups altogether. Each had a guide and a spotter, and they went over the safety regulations and protocol for visiting the gorilla families. ‘Don’t look the males in the eye’; ‘No grunting or growling noises’; ‘Stay at least 10 meters away from the animals; etc.- all for the safety of the people as well as that of the gorillas. After all this, we were ‘introduced’ to our gorilla family- our’s was the “Kwitonda” family. Each guide had a laminated sheet which showed pictures of the various members of that specific family- dominant males, subordinate males, females, and their offspring. It was a family tree of that gorilla family, listing birthdays, ages, relationships to others in the group, etc.- a helpful tool in letting us learn a bit more about the gorillas we were about to meet. After we had all had a good look at the family tree, it was time to pile into the trucks and head up into the mountains. A quick last check of our gear, and we were off! The road up into the mountains was AWFUL- bumps and ruts, potholes and boulders, washouts and puddles- we all hung on for dear life in the back of the truck as it bounced and jostled its way through the small farming villages and up into the foothills of the volcano. Our guide had learned the Kwitonda Family’s location from the spotters in the field earlier in the morning, and once we were on the trail, it would be up to the spotters to inform him of any movements the gorillas might make during their morning feeding period. Then, it would be up to our guide to follow their directions through the dense jungle and up to the gorillas’ location. Easy enough, right? Before long, the road ended- or more accurately, became un-drivable- so we climbed out, shouldered our daypacks, and set out on foot through the fields and forests of the volcano’s foot. The approach to the foot of the volcano was a beautiful hike- neatly manicured fields running off in all directions, a few locals spotted here and there throughout, tending to their crops. The sun was warm, and we quickly began shedding layers as the climb continued uphill. We crossed brooks and cool mountain streams, passed under towering trees and over low hedgerows, always up, always on the climb. Our guide would stop periodically to give us a chance to catch our breath as well as tell us a bit more about the park and its inhabitants. While passing through the farmland, he explained how the locals and the park work together to manage the preservation of the gorillas and their habitat. Much of the money that is paid by tourists for gorilla trek permits flows down into the local economy, a trade-off with the villagers. They in turn allow the tourists to pass through their farmland and refrain from expanding their farms further up the mountain and into the gorillas’ habitat. 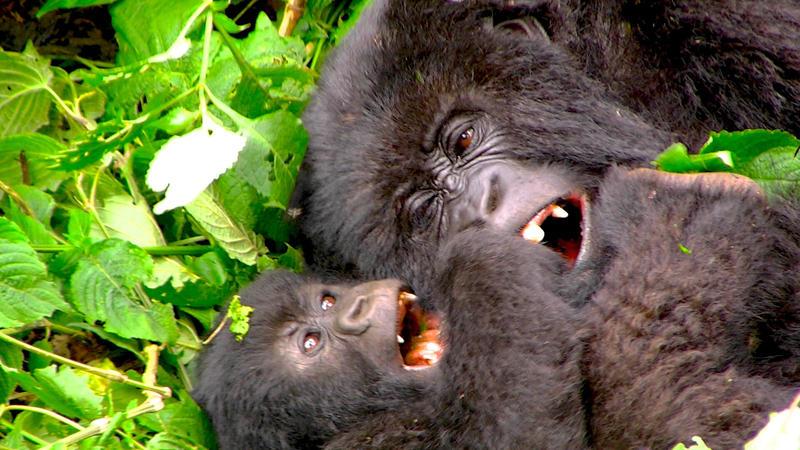 This working relationship allows park officials to successfully manage the protection and preservation of the gorillas and their habitat in the mountains. We eventually came to a stone wall at the edge of the jungle that had been built by the villagers to prevent wild buffalo from getting down into their fields and trampling the crops. There were stones that allowed us to climb and pass over the wall, and then, we were in the jungle. Our guide headed down what he must’ve know to be a trail, though to us it just looked like more dense jungle. He hacked a few branches out of the way with his machete, and we all filed in behind him, climbing single file further up into the dense forest. After an hour on the trail, we stopped once more, and our guide told us to put all of our backpacks in a pile together. He explained that the gorillas were very close, and that we couldn’t take our bags with us. We gathered all of our cameras, batteries, and any valuables (Money, passports, etc.) into our pockets, got into a strict single-file line, directly behind him. We were to stay as close to one another as possible, no one lagging behind and stringing the group out. Adrenaline pumping, we slowly crept along as our guide led us further into the jungle. As we moved together, our guide called out to the spotters, and we could hear them calling back, leading us their position. Our guide was moving very deliberately, and was making frequent low, rolling, rumbling nosies deep in his chest. We could hear similar grunts and rumbles coming from the jungle in front of us, but it was clear that those sounds weren’t coming from anything human. We strained our eyes against the sunlight, searching for any hint of black fur that we could find, but all we saw was green, green, green… It was impossible- the noises sounded SO close, like we were almost on top of them- yet still, we couldn’t see anything. Slowly, slowly, we crept forward through the undergrowth, trying to make as little noise as possible. As we came around a large bush, we found ourselves at the edge of a small clearing, and immediately our guide stopped, holding his hand up to signal us to freeze. He continued making that grunting noise, and never looking away, nodded towards the trees across in the distance across the clearing. We all looked up, and there it was- a small, compact patch of black amongst the green leaves and brown vines of the trees. It was a strange moment- it seemed to take a second for us to realize what it was, even though we all really knew exactly what it was- a juvenile mountain gorilla, perched in the trees, casually munching on some leaves while looking back at us. It was all I could do not to point (‘No pointing’- another rule. Pointing can be viewed as a threat or challenge by adult gorillas, and we didn’t need any of that business…)- there was a gorilla in the trees, less than 10 meters away! We were all busy getting a few shots with our cameras when, before we knew what was happening, a female with her baby on her back came ambling out of the underbrush on all fours, headed directly towards our group. Our guide froze, continued to make his rumbling noise, a bit louder, but still the mother came on. She was no more than an arms-length away when she finally altered her course. We must have startled her somehow, for she made a loud screeching noise and hurriedly hopped away- it was almost like she didn’t realize we were there… Amazing. After she had passed, our guide stepped forward, ever so slowly, and we cautiously followed. We knew we only had an hour to spend with the gorillas once we had come in contact with them, and immediately, the mental timer started ticking away in the back of our minds. We wanted to make the most of it. Luckily for us, the Kwitonda Family was more than happy to oblige. As we crept forward along the outskirts of the clearing, we realized that we were in the midst of almost the entire family group. A mother and her baby seated on a log, partially hidden by leaves, munching away; a MASSIVE silverback, laid down on his elbows, thoughtfully chewing on a stick, battle scars all down his sides; a group of gorillas lolling in the clearing, enjoying a mid-morning snooze; and finally mighty Kwitonda himself, the dominant male, somehow impossibly bigger and broader than all the rest, seated in a hollow of bamboo, his deep rumbling voice making our hair stand on end as he welcomed us to his home. 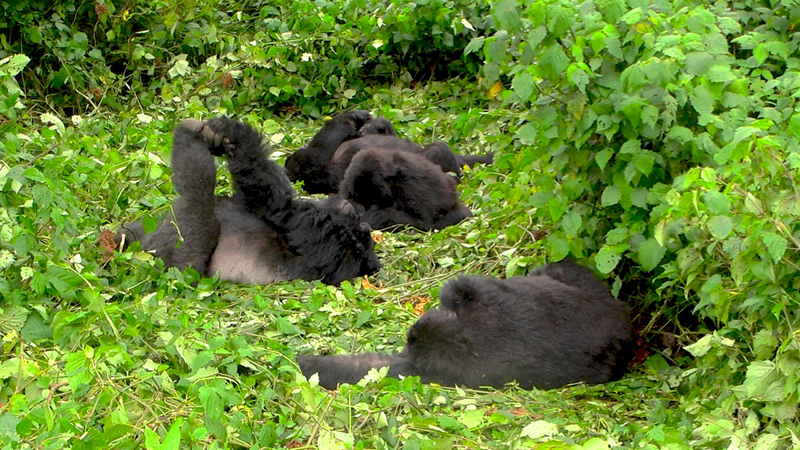 It was incredible- we were SO close to all of these gorillas, and yet they didn’t seem to mind at all. Of course, they have human visitors pretty regularly, so were accustomed to people being around. 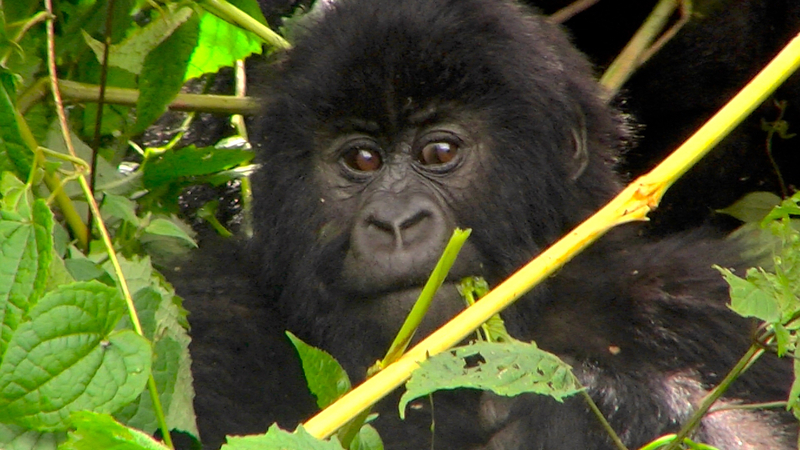 Still, that didn’t take anything away from being face to face with giant mountain gorillas- IN THE WILD. It was awesome. We spent the next hour marveling at these rarest of creatures, awed by their sheer size and evident power, yet amazed at their calm and quiet demeanor. 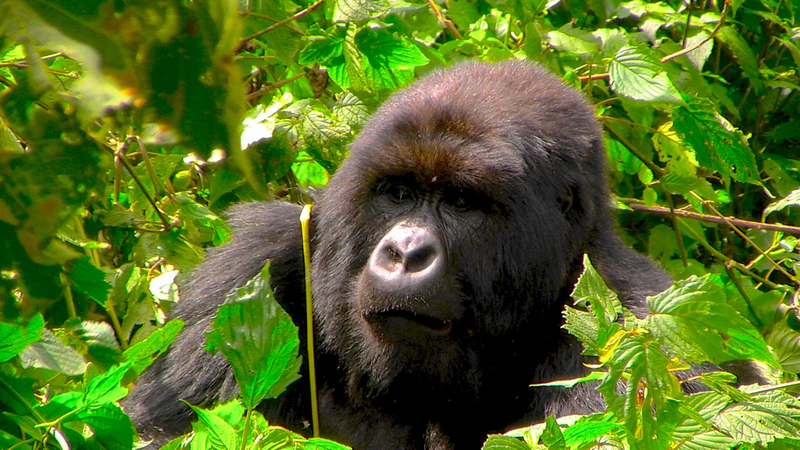 After our brief introduction, Kwitonda had moved off into dense underbrush to feed, and was no longer visible. No matter- we were continually reminded of his near-by presence by the occasional rumble of his awesome voice. Our attention turned to the group of gorillas that were lounging about in the clearing- some were sleeping, some were just lazing about, absent-mindedly chewing on grass, but there was one that was in full-on play mode. It was hilarious- a baby gorilla, no more than a year old, had challenged one of his older brothers to a wrestling match, and though the older one just wanted to sleep, the younger one was being a pest, and would not leave him alone. He kept crawling up on top of his older brother, grabbing at his ears and pulling at his fur until finally, the older brother would grab the little one and toss him away like a rag doll. The baby would roll to a stop, gather himself, and head back towards the group. Then the whole process would repeat itself, with the same conclusion. Once, the tiny baby almost rolled into our feet, and when he realized where he was, gave a little shout and scurried back up into the group, peering back at us over the protective arm of his mother. After he got his courage back up, he stood up, gave himself a King Kong like chest-thumping, and assailed his brother once again. TOO FUNNY! After what seemed like only a few minutes, our hour was up, and we had to start heading down the mountain. We snapped our last photos, saying goodbye and thanking the gorillas for letting us spend some time with them. 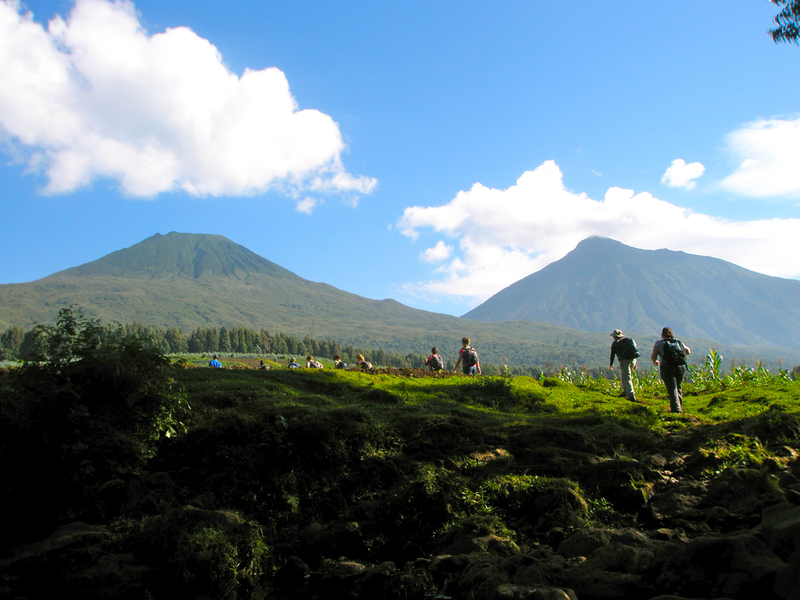 We slowly followed our guide back to our bags, packed up our cameras, and began the trek back down the volcano. Going down was much easier, and as luck would have it, some clouds had moved in and hidden the sun, cooling things off a bit. We quickly came back to the wall, and settled down on the other side to eat the lunches we had brought along with us. It was a quiet lunch, with everyone looking at their photos and rehashing the past hour. A few drops of rain started to fall out of the grey sky as we finished our sandwiches, and we knew it was time to get going. We couldn’t have timed it any better, as the sky opened up just as we arrived back at the truck with a downpour that would’ve had us soaked through only minutes before. We piled in, each tired from the trek and slowly coming down from the high of such an incredible experience. The rain pounded on the roof and splashed across the windshield, the bump and sway of the truck lulling some to sleep. 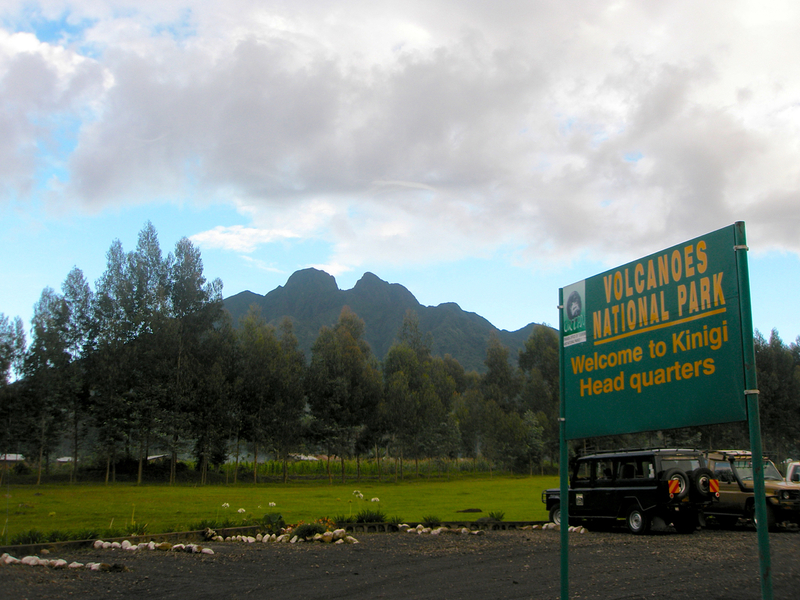 The drive back to the park office was quiet as well, some people sleeping, some gazing out into the rain, gazing back up the slopes of the volcano- honestly, I think we were all still up on the volcano, still in the company of the magnificent mountain gorillas.